Okay so that sounds more exciting than it actually was… to be honest Salta was a mix of tiredness and frustration where things continued to build and go wrong. However, I did have one amazing day trip out from Salta to Quebrada de Humahuaca. The other day trip wasn’t great, so I won’t bore you with the details. The area of Quebrada de Humahuaca is a UNESCO World Heritage Site and an amazing one at that. 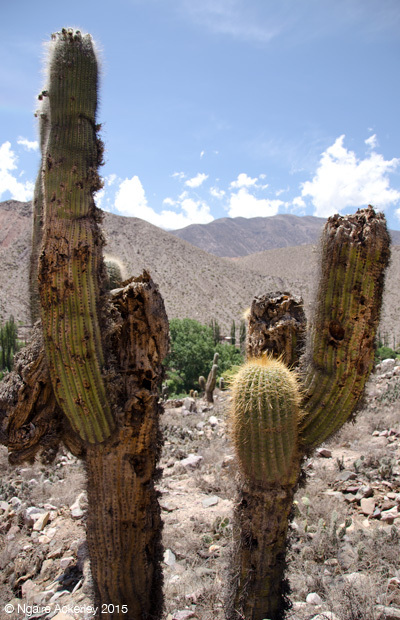 It’s located in the north-west of Argentina, with mountains and Inca ruins to stand out amongst the cactus. Driving north of Salta you see plenty of green mountains littered with cactus and then as we turned off the highway, we suddenly hit mountains of a variety of colours. The stand out mountains are known as the ‘mountains of seven colours’. The colours of the mountains are created from the different minerals and metals. The little towns along the way are cute, but very touristy and when you get to the town of Humahuaca the altitude suddenly hits. It’s just over 3000m and very hot. Our guide said that compared to spots like in Nepal, because of the dryness and heat it can feel up to 4000m high. Less be said, it’s pretty easy to start to get a headache. Humahuaca was a great day out. It was really interesting landscapes so different to elsewhere in Argentina, once again UNESCO did well in choosing a lovely area to protect. For now, I’ll leave it there. I’m off to continue my blood noses and fun with horrible altitude by heading back into Chile to San Pedro de Atacama before heading off to Salar de Uyuni! Bolivia here I come! I don’t comment enough, but I’m loving following along on your adventures! Thank you lovely lady! Still trying to read yours when I get a chance too! The Seven Mountains are breathtaking! Sure were – totally different landscape!